Venezuela persists in a belief that the entire region west of the Essequibo River, including the islands in the river, is rightfully theirs. With over 50,000 square miles of savanna and forest cover, the Essequibo Region makes up about two-thirds of Guyana’s total territory. Since then, the Geneva Agreement of 1966 – signed by Britain, Guyana (then British Guiana), and Venezuela, and filed with the United Nations – has failed to resolve the ‘controversy.’ From Venezuela’s current aggressive stance, one would believe that the Guyana-Venezuela border is under revision, which is not the case. As I see it, Venezuela’s attempt to nullify the Arbitral Award of 1899 is an act of aggression by a larger nation with greater military power towards its small, poor neighbor. Over the years, this flimsy ‘controversy’ has served to stifle Guyana’s economic development. Contrary to the terms of the Geneva Agreement of 1966, he further declared that the British “recognize it’s a case that still needs negotiation.” He made no mention of the territories in the Orinoco River basin the British had ceded to Venezuela under the Arbitral Award of 1899. Guyana, Essequibo is we own. We ain’t giving up…not a blade o’ grass. Ain’t it time to move we capital to Essequibo? MADuro is behaving like a cornered rat…..in trying to hold onto power. Jailing leader of opposition for several years. Hugo Chavez must be turning in his grave having endorsed the lunatics as his successor. Only one outcome…..the mighty oil corporations the winners. Kamtan, it’s Obama V Maduro with Guyana caught in between. Agree with you that the mighty oil corporations are the winners. With the US government backing them, they have no thought for the chaos they leave in their wake. Awful. As if Venezuela didn’t already have enough oil. The UN will ultimately, and finally, resolve this boundary issue by reinforcing the Arbital Accord on 1899. 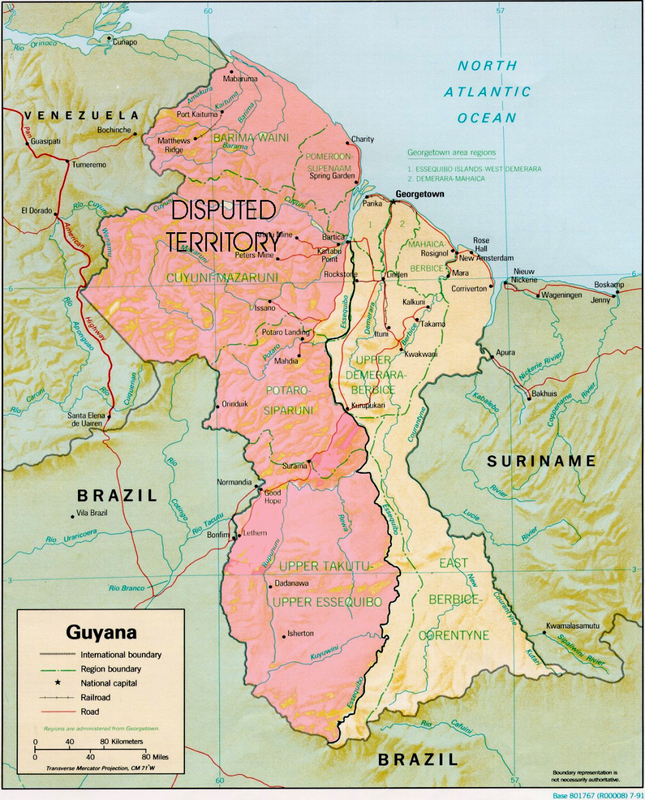 The shape and size of Guyana will remain as we know it , as the world knows it, Guyana is 83,000 square miles and since 1899 it was governed by the British before becoming an independent country and subsequently a Republic. Also, since 1899, all the people who resided and are residing within its bordaries were/are identified as Guianese/Guyanese. Their legal documents, (birth, marriage, death certificates and passports, etc.) show them as citizens of British Guiana or Guyana. They were educated in Guianese/Guyanese schools and spoke English. They participated in Guyanese elections. Since 1899 the people in Essequibo were never considered a part of Venezuela, were never identified as Venezuelans, never participated in Venezuela’s elections and were never supported by Venezuela. As I recall, the only issue of aggressive land dispute that Venezuela had with Guyana was Ankoko Island in the Cayuni River, in 1966. It was a David and Goliath conflict in which Venezuels flexed its larger military muscle. Maduro would be wise not to mess with Guyana. If he tries to be a bully, he’ll get beat and destroy his political future. Thanks, Deen. In 1899, the Venezuelans got a good deal with the Orinoco River basin. Now, they want it all. It’s unfortunate, though, that Guyana is caught in the fight between Venezuela and the USA. Great article, Rosaliene! Where does CARICOM stand on this, especially in light of some of the Caribbean states’ sweetheart deal with Venezuela to purchase oil at preferential rates via Petrocaribe? Thanks, Tony. It’s a delicate situation for CARICOM member states. In their official statement on Venezuela’s latest claim, the regional body reaffirms its favorable relationship with Venezuela, but takes a stand in support of Guyana. It is Sheer Greedy Venezuela is, Remember, USA, Has is Force over in Columbia, waiting Patiently for Venezuela, To make any right Move to topple Venezuela government…. Yes, it’s quite a volatile situation for the government of Guyana. WOW. The Venezuelan government has truly gone too far. See article below. Guyana Foreign Affairs Minister Carl Greenidge says he has learnt that Venezuela has a satellite system that allows them to feed information to Google. Google Maps of Guyana’s Essequibo Coast Public Road has been renamed Av. 100 Bolivar and a street has been named Calle 100 Guayana. Simon Bolivar was a Venezuelan military and political figure who played a key role in chasing out Spanish colonizers and establishing an independent nation. I AM is absolutely right – the U.S. is holding patiently, watching Cuba and Russia in Venezuela. Excellent article, Rose. Americans hear so little and knows so little of its neighbors. Thanks, Angela. Through my articles on Guyana and the rest of the Caribbean Region, I hope to bridge that gap.